The elusive Dow 20,000… readers rise to Rickards’ defense… the quest for “that piece of paper”… and more! Just before going on holiday break, Congress took action that forces Uncle Sam to pay out scads of cash to a small circle of in-the-know investors. Last Friday, President Obama signed the annual Pentagon spending bill into law. Congress tucked a subtle but hugely important change into this year’s version. But the word “limited” was struck from the 2017 model of the National Defense Authorization Act. Along with that change comes a provision authorizing the Pentagon to begin “research, development, test and evaluation” of space-based missile defense systems. “That opens the door for virtually unlimited spending on new missile defense systems aimed at countering a nuclear threat from Russia and China,” says the Orange County Register. The bare minimum cost for such systems, according to a 2012 study by the National Academy of Sciences, is $200 billion. That’s just to build it; day-to-day operations will cost hundreds of billions more. No matter: It’s “an opportunity to waste a prodigious amount of money,” he added. And that’s the whole idea: Like the $400 billion F-35 fighter jet, the new missile defense program will be parceled out among hundreds of contractors in dozens of states to ensure Congress will keep the money flowing. Note well: Congress and the current president have set these wheels in motion even before the next president follows through on his plans to nearly double Pentagon spending. But exactly where will that $2 million per minute flow? Sure, the “Big Five” defense contractors and other large-cap firms will get the lion’s share. And you can pick up all those companies in a one-stop shopping play like the iShares U.S. Defense and Aerospace ETF (ITA). As we’ve been saying for several days, it’s the safe way to play the coming defense boom. But there are other smaller companies that stand to gain much more — companies that can win a single contract and see its share price multiply five-fold overnight. Which have the most potential? That’s the question Jim Rickards and his team have been at work on day and night since Trump’s election. He’s been in constant touch with his contacts in the military and the intelligence community — contacts that he’s cultivated for more than a decade. “The idea is simple yet powerful,” Jim explains. “If you’re familiar with drones in general. You know that drones are deployed 15,000 feet in the air. They fly over enemy territory to collect data in dragnet fashion. “Then, back at base, you employ smart heuristics to sift through the vast array of data to narrow down to the target. Then, a subject matter expert is employed to analyze the true value of the intelligence he has. After all of that important legwork is done… you get to the most important step: You decide whether or not to take action on your information — whether or not to execute. 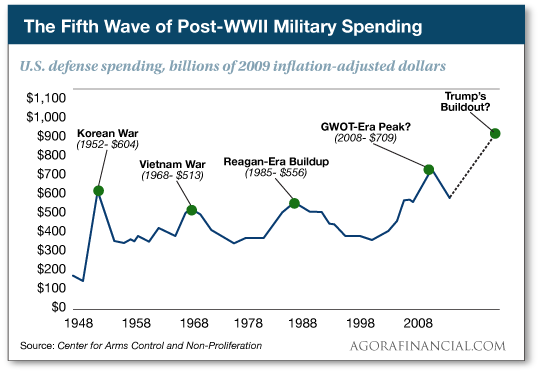 We’ll be talking much more about this fifth wave of military spending during 2017. But for maximum profit potential, now’s the time to act. Days ago, Jim and his team issued their initial DRONE recommendations to charter subscribers of his newest premium research service. And for the last week, we’ve been offering a generous charter-subscriber discount. That discount expires at midnight tonight. To learn more about the DRONE System and secure the charter-subscriber discount, act here. Only two trading days left in 2016, and the Dow is still nearly 175 points shy of the 20,000 mark. Stocks in general took a tumble yesterday, the Dow shedding 111 points. This morning, it’s off fractionally at 19,826. The other major U.S. indexes are likewise little moved. Both bonds and gold benefited from the safety trade yesterday, and they’re holding onto those gains today. The yield on a 10-year T-note is 2.49%… and gold is less than a buck away from $1,150. The few traders on duty are chattering about the meltdown at Japan’s Toshiba. Shares have plunged 40% the last three days thanks to trouble at its U.S. nuclear energy subsidiary — Westinghouse Electric, acquired in 2006. Long story short, Westinghouse’s valuation might be far less than advertised. As it is, the unit hasn’t turned a profit since 2013. More grist for the marijuana-legalization mill: Traffic deaths have fallen in states that have enacted medical marijuana laws. Researchers at Columbia University have just published their findings in the American Journal of Public Health. In states that allow medical marijuana, traffic deaths have fallen 11% since the legalization. What’s more, states with those looser laws have 26% lower rates of traffic deaths compared with states that haven’t passed such laws. Elsewhere, we see the legalization wave suffered a minor setback yesterday in Massachusetts: Lawmakers pushed back the retail sale of recreational weed another six months, to July 2018. But that doesn’t change the fact that personal possession, use and cultivation became legal 14 days ago. Still other states have looser laws taking effect this coming Sunday, Jan. 1 — an event that in the past has given a huge boost to select “penny pot stocks.” Look here to see how a mere $50 investment can turn into a massive fortune. A recovery in base-metal prices during 2016 has pushed up the U.S. Mint’s costs to produce the penny for the first time since 2011. 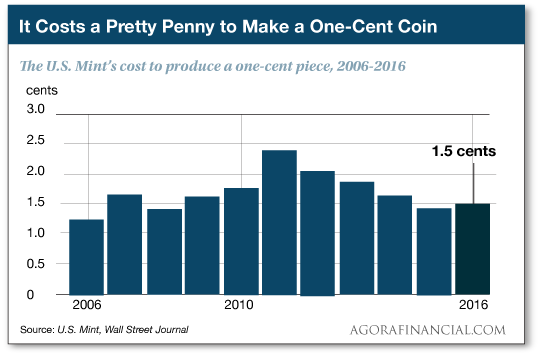 It costs a cent and a half to produce the 1-cent coin, according to the Mint’s annual report — due for release soon. And there’s no prospect of bringing down that cost with a different metal. “There are no alternative metal compositions that reduce the manufacturing unit cost of the penny below its face value,” said the Mint’s 2014 report. The nickel is also a money-loser. An important distinction: We’re talking about the Mint’s total production costs, not the melt value of the coins. Even with rising metal prices, there’s nothing to be made from melting down a penny — never mind that it’s against the law. In fact, the only coin issued since 1971 that has a melt value higher than its face value at this time is the penny made before 1982. Those had 95% copper and, according to the Coinflation website, are worth 1.67 cents at today’s metal prices. The contemporary penny is 97.5% zinc; its metal value is two-thirds of a cent. “I concur with everything readers stated about the track record predictions of Mr. Jim Rickards,” begins today’s mailbag. “It has been horrendous. Why are you asking us to believe it now? I will never subscribe to his stuff again. “Let’s see,” writes another, “Rickards has had us in a secret Swiss bank vault, an almost daily ‘special’ urgent update and more. “I have no doubt the guy is smart, well connected and well intentioned. My problem is the daily pounding of some new startling event. His advice starts to feel like a mountebank on the midway. Give it a break. “Unfortunately, a prophet is never accepted from his own town!” counters still another reader. “I think Jim Rickards is ahead of the time. “The stage is set for a complete crash/reset of the monetary system. Yes, it’s frustrating to see and realize that gold has not broken out as JR has indicated… yet! “However, that doesn’t mean the storm has not dumped a huge amount of snow and all it needs is the snowflake! Adds one more: “Yes, I agree Jim Rickards at times seems unduly concerned with geopolitically conditioned effects from which he reasons to his predictions. “You state that Rickards did not say that gold would go in a straight line up to $10,000 an ounce, and I understand that,” a reader writes. “Gold is not a commodity trade for short-term gains but a long-term hedge against inflation. I invested in gold about five years ago on Rickards’ recommendation, and the value of that investment is now down $500/oz. The 5: You’ve certainly been patient. We encourage you to watch your inbox this Saturday for a special edition of our 5 Things You Need to Know. Jim will spell out why “it’s only a matter of time before a link in the physical-gold delivery chain snaps and a full-scale buying panic erupts.” And he’ll identify the markers to watch so you’ll know when it’s go time. “As to the college discussion,” a reader writes, “I had a successful career as a CPA. “My first year accounting class was valuable, as was a very poorly taught philosophy class in my final year. The philosophy class was so bad it inspired me to think about such topics as a rebuttal to what was being taught, and I then derived what is still pretty much my philosophy of life. However, those two classes were only about 5% of my college education. “To everyone at The 5,” writes our final correspondent, “I thoroughly enjoy the noteworthy and timely nuggets of information you provide. The 5: And you likewise! P.S. Final notice: The charter-subscriber discount to the newest Jim Rickards premium service — identifying tiny defense stocks poised to explode under a Trump presidency — expires tonight at midnight. Click here to seize the moment. The “official” observance of New Year’s Day is Monday, Jan. 2, and the markets will be closed. Look for the next episode of the weekday 5 on Tuesday.